Children of all ages experience stress and anxiety, but they will respond to it differently depending on their age, personality, and even their personal coping mechanisms. It can be difficult for parents, especially for parents of toddlers, to recognize signs of stress or anxiety in their children. It can be even more difficult to know what to do. Extreme "clinginess" or attachment is instinctual for anxious toddlers. This may be especially common not just during times of major changes in your family, but it can also happen as you try to help your tot through a milestone transition, such as giving up the bottle. How to help: Your little one will likely want to hang on to something -- anything -- when everything else around him seems to be changing. While he probably prefers to cling to you, it may help to offer another object for him to take everywhere. Try to find a special lovey or comfort object that will offer your little one some consistent security. Little kids who can't explain to you that they are feeling upset and worried may start to display behavior that tips you off that something is wrong. Among those changes may be sleep problems. How to help: Stressed children may begin having night terrors or start sleepwalking. You shouldn't wake a child during one of these episodes. Instead, make sure he's safe. You don't need to bring the child into your bed or sleep next to him (that can start other bad habits). You can sit with him, though, and gently try to soothe him until he relaxes again. Be warned, learning to relax can take a while. Regression is another classic sign of childhood stress. A toddler who had been successfully toilet trained may begin having frequent accidents or a 3-year-old may start asking for a bottle and start acting like a "baby." 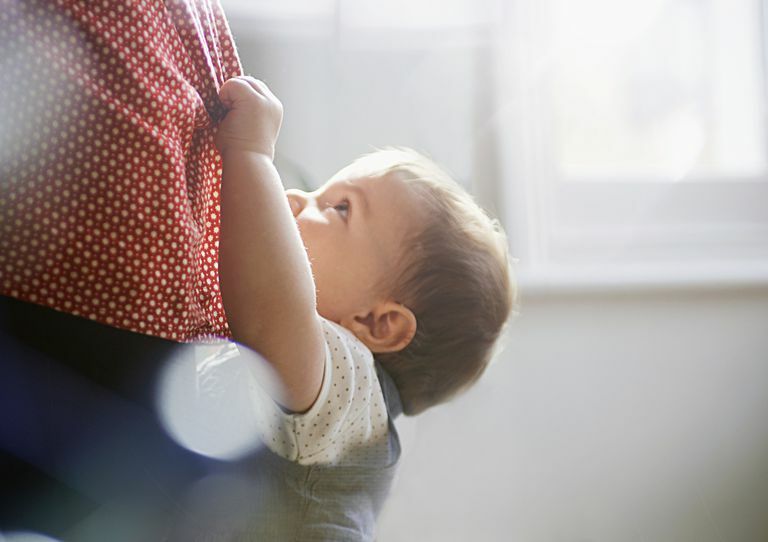 How to help: Major changes, especially a sense of loss or the birth of a new sibling, may spur this type of anxiety and reaction in a toddler. In short, the pressure to act like a "big" kid can overwhelm your little guy and make him feel like falling back to an earlier stage of development when things were easier and safer. It can be frustrating for a parent, but don’t criticize your child for acting babyish -- that may just increase the feelings of stress. Instead, make him eager to do big boy things. He might be in charge of singing to his newborn sister or helping pack his own lunch for nursery school. When it comes to toddlers experiencing stress from big changes, in most instances time will help your child get used to the new situation. Meanwhile, consistency and lots of patience and love will go a long way to helping your child overcome the stress and anxiety.